Raam refers to the Lord himself and Navmi means nine. It was on the ninth day in the mothe of Chaitra in the middle of the day that Shri Raam manifested himself for the upliftment of dharma. He is the seventh incarnation of Lord Vishnu. It is during this incarnation that he destroyed the demon king Raavan who caused havoc within the world. Raavan had also kidnapped Sita Maa who is the wife of Shri Raam. The story of Shri Raam is related in the Raamayana which literally means the journey of Shri Raam. Here is a wonderful mantra that explains the epic of Ramayan. Paschaad Ravana Kumbakarna Hananang Etad Shri Raamaayanam. 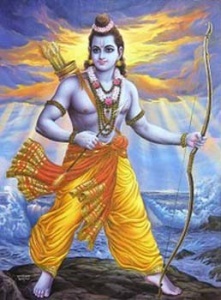 Ramayana, the story of Rama, narrates Rama’s banishing to the forest, the killing of the golden deer, the abduction of Sita, the passing of Jatayu, conversations with Sugrieva, destruction of Vali, Crossing of the ocean, destruction of the city of Lanka by fire and the killings of the demons, Ravana and Kumbhakarana. The gracious Lord, who is compassionate to the lowly and the benefactor of Kausalya. appeared. The thought of His marvelous form, which stole the heart of sages, filled the mother with joy. His body was dark as a cloud, the delight of all eyes; in His four arms He bore His characteristic emblems (a conch-shell, a discus, a club and a lotus). Adorned with jewels and a garland of sylvan flowers and endowed with large eyes, the Slayer of the demon Khara was an ocean of beauty. Joining both her palms the mother said, .O infinite Lord, how can I praise You! The Vedas as well as the Puranas declare You as transcending Maya, beyond attributes, above knowledge and beyond all measure. He who is sung by the Vedas and holy men as an ocean of mercy and bliss and the repository of all virtues, the same Lord of Lakshmi, the lover of His devotees, has revealed Himself for my good. The Vedas proclaim that every pore of Your body contains multitudes of universes brought forth by Maya. That such a Lord stayed in my womb, this amusing story staggers the mind of even men of wisdom. When the revelation came upon the mother, the Lord smiled; He would perform many a sportive act. Therefore He exhorted her by telling her the charming account of her previous birth so that she might love Him as her own child. The mother’s mind was changed; she spoke again, Give up this superhuman form and indulge in childish sports, which are so dear to a mother’s heart; the joy that comes from such sports is unequalled in every way. Hearing these words the all-wise Lord of immortals became an infant and began to cry. Those who relate this story says Tulasidas) will attain to the abode of Hari and will never fall into the well of mundane existence.